Domain names are defined as the human-friendly forms of internet addresses, and are commonly used by companies to promote, market and advertise the company’s website or online-store. With the rapid increase in the cross-border movement of goods and services over the internet, domain names have become so intrinsically linked to the operation of a company that they are deemed as having substantial value to the company’s goodwill. It is therefore crucial to the business of a company that when considering a domain name, proper due diligence is conducted to ensure that the registration of said domain name would not amount to an infringement of another person’s trade mark. Our Trade Marks Act (the “Act”) defines a trade mark as any sign that is capable of being graphically represented and capable of distinguishing the goods or services of one undertaking (i.e. any person, company or business entity) from those of another undertaking. A sign may include a word, design, letter, numeral, colour, combination of colours or a combination of the foregoing. In essence “Pepsi”, “Chanel”, and “McDonalds” are all examples of well -known trade marks. The registration of a trade mark grants upon the registered proprietor an exclusive right to use the mark for the purposes of identifying his goods and/or services, or to authorize another to use the mark in return for consideration. Generally, the mere registration of a domain name which includes a registered trade mark owned by another person will not automatically result in the infringement of the said trade mark. It is the use of the registered mark in a prohibited way that triggers the infringement. the sign has a reputation in Jamaica and the use of the sign, being without due cause, takes unfair advantage of, or is detrimental to, the distinctive character or the reputation of the trade mark. For the purposes of the Act, a person uses a sign if he does anything which associates or purports to associate the sign with any goods or services which includes offering or exposing goods for sale under the sign or uses the sign on business papers or in advertising. Where a company includes a registered trade mark in its domain name, without authorization from the registered proprietor, for the purposes of promoting, marketing, advertising and offering for sale goods or services on a website and the said goods or services are similar or identical to the goods or services for which the registered trade mark is being used, this would amount to an infringement of the registered mark under the Act. The use of the registered trade mark by the company in this manner is likely to mislead and/or deceive the public that the website has been endorsed by or is affiliated with the registered proprietor of the trade mark. Disputes relating to domain names are bound by the Uniform Domain-Name Dispute Resolution Policy ("UDRP"). The UDRP was implemented by the World Intellectual Property Organization (WIPO), of which Jamaica is a member, and sets out procedures for the resolution of disputes concerning domain names worldwide. The respondent's domain name has been registered and is being used in bad faith. Bad faith may include evidence which shows that by using the domain name, the respondent has intentionally attempted to attract, for commercial gain, internet users to his web site or other on-line location by creating a likelihood of confusion with the claimant’s mark as to the source, sponsorship, affiliation, or endorsement of the web site or on-line location or of a product or service on the web site. Under the UDRP, the remedies available to a successful claimant i.e. a trade mark proprietor claiming infringement with respect to a domain name are the transfer of the disputed domain name registration to the claimant or the cancellation of the domain name registration by the infringer. There is no requirement for the infringer to be compensated for the transfer or cancellation of the registered domain name. In order for the infringer to be compensated for the costs incurred in registering the domain name, the trade mark proprietor would have to agree to such compensation. As e-commerce continues to grow worldwide, there is no doubt that the use of domain names by companies will increase significantly. As domain names are now considered part of a company’s brand, companies must ensure that domain names are selected carefully and that the registration of a domain name would not amount to an infringement of another person’s brand. 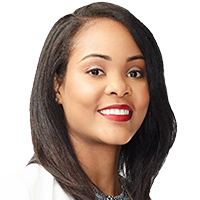 Samantha Moore is an associate at Myers, Fletcher & Gordon and is a member of the firm's Commercial Department. Samantha may be contacted via samantha.moore@mfg.com.jm or www.myersfletcher.com. This article is for general information purposes only and does not constitute legal advice.